That’s the subject of Hao Wu’s slick, inventive, and disturbing documentary, “People’s Republic of Desire.” It profiles two rising stars of this new medium. 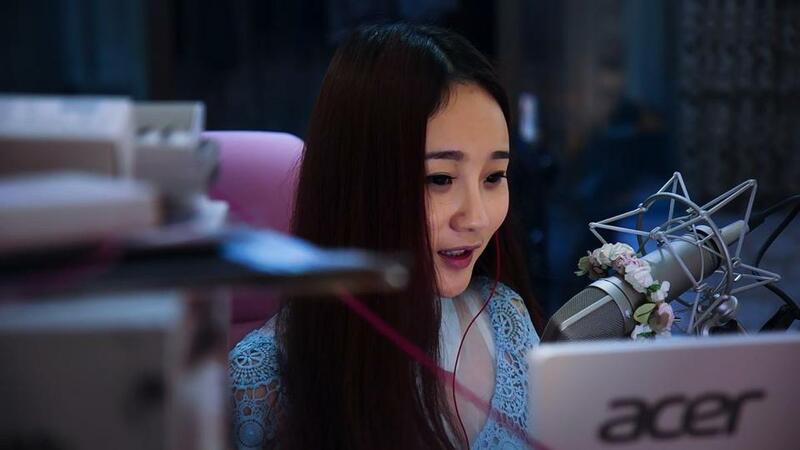 Shen Nen, 21, is dressed and made up to look younger as she streams songs, messages, and solicitations to her audience for virtual gifts (tokens for real money). Audience members respond in kind, with adulation and come-ons. Big Li, 25, has no discernible talent. He’s crude, abusive, and from a working-class background — thus appealing to his millions of Diaosi (young males who are poor, without prospects, socially marginal, and held in contempt), followers who identify with him and think that if he can make it, so can they. Meanwhile, high-rolling Tuhao, or patrons, buy expensive “gifts” for the stars — ostensibly to earn the online acclamation of fans and gain access to the celebrity world. But agents called Big Bosses cut deals with the Tuhao during the high-stakes gambling of the annual popularity contest. Here stars compete to see who can get the most votes – all bought by the wealthy backers, thus avoiding the inefficient middleman of a democratic process. It’s a giant money-making scam that rewards investors, exploits and discards the stars, and deludes the lumpen fans into believing they are participating in a world of celebrity and fame. In its deceptively glitzy and glib investigation into this virtual dystopia, “People’s Republic of Desire” suggests that the specter haunting our brave new world these days is not communism, but the familiar evils of vanity, materialism, inanity, and bad taste. “People’s Republic of Desire” screens at the Brattle on Dec. 11 at 7 p.m. . The director will participate in a Q. & A.
Christmas Island, discovered on Christmas day, 1643, by the British explorer William Mynors, an Australian territory in the Indian Ocean off the coast of Indonesia. As seen in Gabrielle Brady’s eerie and affecting documentary “Island of the Hungry Ghosts” (2017) , it’s a place of dreamlike images and tragic contrasts. Every year millions of red crabs migrate across the island to their breeding grounds on the shore. You might have seen this phenomenon in Werner Herzog’s documentary “Echoes from a Somber Empire” (1990) or in his feature film “Invincible” (2001), where the migration is used for nightmarish effect. But as one of Brady’s subjects demonstrates, the crabs are actually gentle. Officials take painstaking measures to protect them in their march. The island is also said to be populated by the restless ghosts of the title, the spirits of Chinese laborers who were brought in a hundred years ago to work as virtual slaves They were not given a proper burial. To placate these lost souls the Chinese community burns offerings, and some venture deep into the jungle to pray at the unmarked gravesites. These scenes evoke the uncanniness of the films of Thai filmmaker Apichatpong Weerasethakul, especially his “Uncle Boonmee Who Can Recall His Past Lives” (2010). More topically, the island hosts a detention center for thousands of refugees. There they are separated from their families and held in custody for indeterminate periods, sometimes for years, without knowing how long they will be kept there or what will happen next. A young trauma therapist, the mother of two children, listens to their tales of horror. She feels helpless and fears she will not be able to cope. Brady weaves together these narrative lines into an otherworldly, heartbreaking fugue. Like Gianfranco Rosi’s documentary “Fire at Sea” (2016) about a similar crisis on the Italian island of Lampedusa, “Island of the Hungry Ghosts” meditates on natural wonder and human evil with a poetic sensibility that is quietly overwhelming. “Island of the Hungry Ghosts” screens as part of the DocYard series at the Brattle on Dec. 10 at 7 p.m. The director will participate via Skype for a Q.&A. In his seminal book of film criticism “From Caligari to Hitler,” Siegfried Kracauer analyzed German cinema of the Weimar era, 1918 to 1933, to determine how the films reflected how audience’s unconscious fears and desires and prefigured the Third Reich. But what happened after Hitler came to power and controlled the film industry? Rüdiger Suchsland (whose first film takes its title and text from Kracauer’s book) examines the thousand or so films produced during that period in his documentary “Hitler’s Hollywood” and finds that all was not heavy-handed propaganda, but sometimes feel-good escapism. True, Nazi cinema did produce that masterpiece of mass manipulation Leni Riefenstahl’s “Triumph of the Will” (1935) and such grotesque anti-Semitic screeds as Jud Süss (1940) and “The Eternal Jew” (1940). But other, less overt films include “Hitlerjunge Quex” (1933) (which was released in the United States as “Our Flags Lead Us Forward”) in which the abused son of a Communist finds fellowship and cool uniforms in the Hitler Youth — it’s a kind of Nazi-style “Boys Town” (1938), though with a self-sacrificial death. And in the waning days of the war, “Kolberg” (1945), an extravagant period production about the Prussian victory over Napoleon in the title battle, allowed Germans to dream of better times while the Allies closed in. Should we fear that the real Hollywood is similarly controlling our minds? Perhaps to some extent, but these days it can’t compete with the insidious lies and propaganda spread by social media, conspiracy websites, and certain news networks. “Hitler’s Hollywood” is available on DVD from Kino Lorber for $17.97.